Have you started planning your 2010 Play Day? If not, it’s time to get started. KaBOOM! Play Days, presented by Mott's, will be held all over the country during the week of September 18 - 26. Join this national celebration to save play in the lives of children! One child, acting as “seaweed,” stands in the middle of this area, with the rest of the children (the “fish”) lined up on end of the ocean. At your signal, the fish try to cross the ocean. 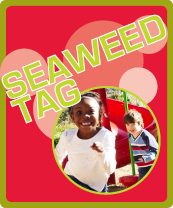 If tagged by the seaweed, they also become seaweed and must keep one foot planted on the ground at all times. Those fish who make it to the other side try to cross again. The game continues until all the fish have become seaweed! The last fish tagged is the first to act as seaweed for the next round. Divide the group into two even teams. Then, mark the field of play and set-up two goals using cones. This game is played the same as regular soccer, except that the kids use their hands and feet to support them. Everyone must be sitting down, with feet and both hands on the ground. 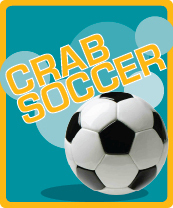 Once the game starts, the players can lift their bodies and walk in a crab-like position. While walking this way, each team must try to score a goal. Remember, no hands are allowed in soccer, so players may only move the ball with their feet. One goalie is permitted for each team and they are allowed to use their hands to protect the goal. The first team to five points wins the game! 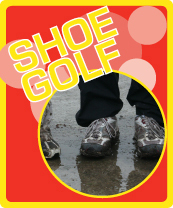 Choose what type of shoe golf you’d like to play: accuracy, distance, or least kicks to the goal. Have the children unlace their shoes so that they rest loosely on the foot. For regular golf, children take turns kicking their shoes towards the “hole” beginning with the child who had the least amount of strokes on the previous “hole” and as they move on, based on whose shoe is currently the farthest from the hole. For distance, have the children stand behind a line or area on the grass, then have them flip the shoe as far as possible. Whichever child has the longest “drive” wins. Start planning your Play Day here.